The CGT, which is against President Macron’s current Grand Débat proceedings, is being supported in the strike by other unions and left-wing groups including Solidaires, the NPA, PCF and FI. Workers, public servants, and retired people were also invited to march. The unions’ grievances include drawing further attention to what they call the declining buying power among normal people in France, and demanding a fairer taxation system. The CGT has already called for a repeat of today’s strike, dubbing the movement “social emergency Tuesdays” (“les mardis d’urgence sociale”). In local schools, some disruption may be felt, especially in canteens at lunchtime. Some will operate on a skeleton service, offering salads and cold meals. In other schools, there will be no canteen at all, with children required to bring in their own packed lunch. Certain tourist attractions may experience delays and problems. The Eiffel Tower group has already said that “access may be disrupted”, and has advised visitors to stay updated through its Twitter account. National library La Bibliothèque Nationale de France, and the libraries of La Sorbonne have both said that visitors may experience problems, including the closure of some reading rooms and a change in general opening hours. 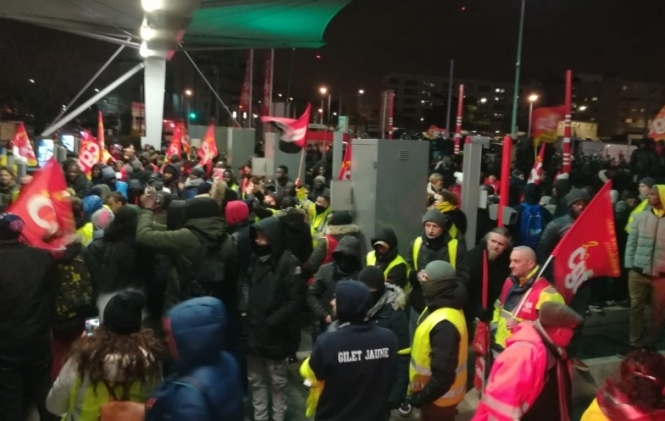 International food market Rungis earlier experienced problems and stoppage too after some union members blockaded the warehouse. Public transport group RATP - which owns Métro lines, bus links and the city’s trams - has said it anticipates “normal circulation on most of the network”. Some stations may be closed as the march passes by. Train group SNCF has said there will be a “normal service” on all city lines.